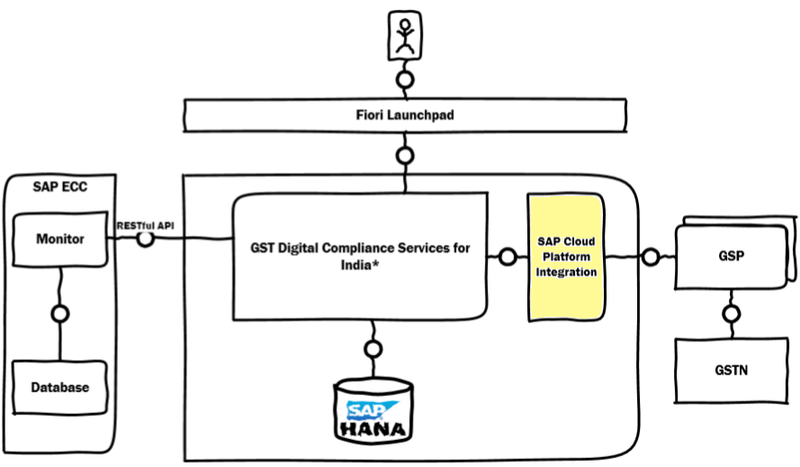 SAP recently introduced a cloud service called SAP Localization Hub, Digital Compliance Service for India to support companies, doing business in India, connect to the Indian Government for submitting GST specific information. 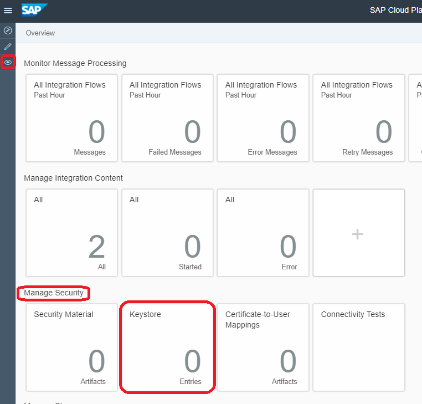 This blog talks about the steps that need to be performed to enable SAP Cloud Platform Integration to connect Digital Compliance Service with a GSP. When you buy the Digital Compliance Service license, you get 2 Cloud Platform Integration tenant with it. One tenant serves for development, while the other should be used for production. For each tenant, you get a welcome email outlining the details about the tenant. Please note that each Cloud Integration tenant has its own sub-account and access needs to be provided to each user at a sub-account level. 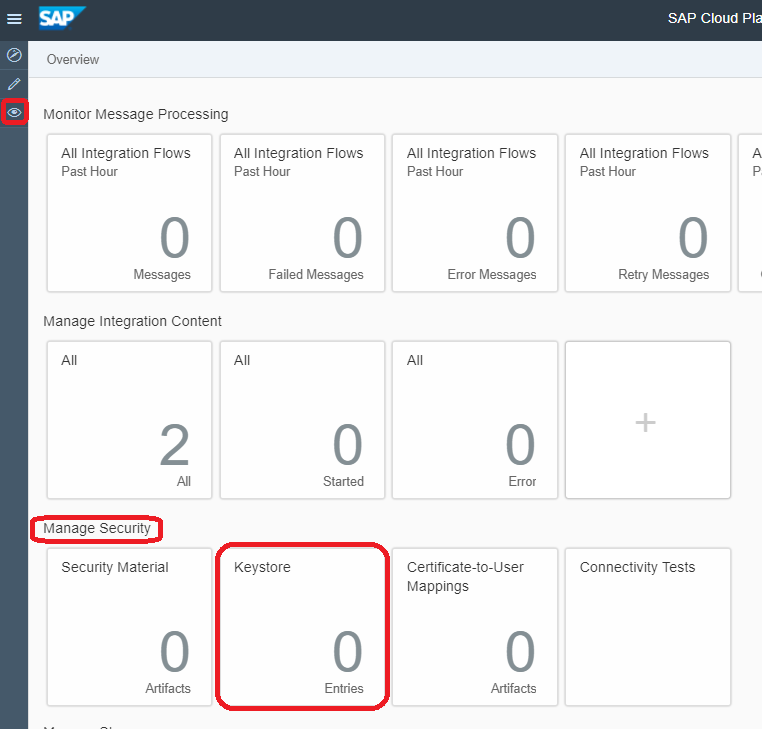 ESBMessaging.send Any user having this role can be configured in the destination used by the DCS to connect to a Cloud Integration endpoint. This role authorizes the user to run any integration flow on the tenant. AuthGroup.Administrator Allows a user to perform all operational tasks like managing deploy/undeploy security artifacts, edit the keystore, map users to certificate, manage/deploy/undeploy integration flows, view logs (except message payload), manage message queue (except view message payload), manage data store (except view data store content), manage log levels, manage message locks, etc. AuthGroup.IntegrationDeveloper Allows a user to develop integration content, copy content from the discover view, configure the integration flow, manage resources, update content package, deploy/undeploy integration content, manage credentials and security material, view logs, manage log levels, etc. NodeManager.deploysecuritycontent Allows a user to only manage security material, including the keystore of the tenant. AuthGroup.BusinessExpert Is an end user of the integration process. The corresponding user has access to view the message payloads. Assign the above roles to the user accordingly. You can also find it in the welcome email under Web UI URL. Based on the role provided to your user, your views and the operations that you can perform, will differ. The following is a screenshot of the Discover View – it lists all the content pre-delivered from SAP. Here you will find ready to use content for common usecases – after doing small configurations, like endpoints, certificates, users, etc, it can be run for production scenarios. Unless you need customization, you do not need to perform any additional modelling on this content. If you want to build an own content or add customization/adjustments to the pre-delivered content, you can use the next view, which we call the Design View. This view allows you to build or update content using a visual BPMN modeler, as can be seen from the screenshot below. You get the content directly from the GSP. The content shall be provided as a zip file containing the content package. You need to import this content into the design view of your development tenant. Go to the Design view. The package gets added successfully to the list of packages in the design view. Here you shall find a template that needs to be adapted to work for a GSP. Now Open the package and go to the Artifacts tab to see the integration flows bundled with the package. In order to start working on the integration flow, you need to Copy the content package to the design view: Click on Copy. Now that you have got the content, you can either edit it to enhance it or configure it to add basic parameters. Edit allows you to change the integration flow to incorporate customizations and adjustments. 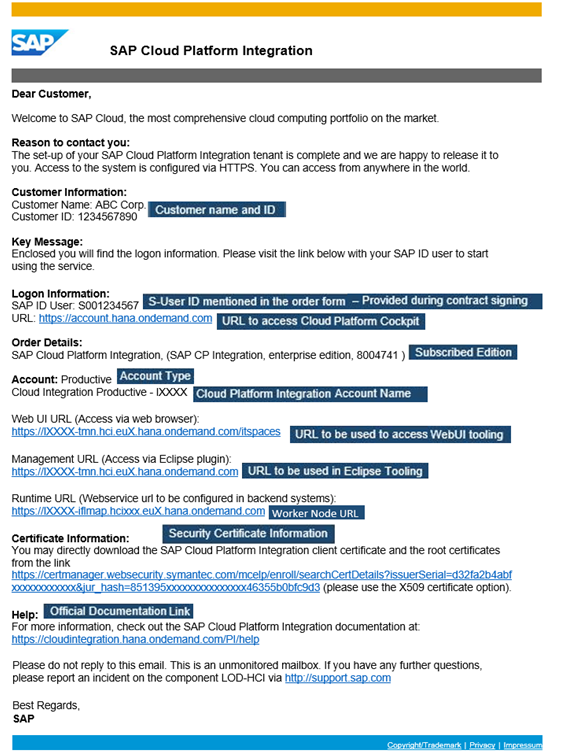 In this process, you shall loose the eligibility to receive updates to the content whenever new updates to this integration flow is published by SAP. Once you click on Edit, a palette gets enabled on the left side of the canvas. Use the process steps from the palette to enhance your integration flow. Once done, you have the option to Save or Deploy the integration flow. Configure allows you to enter the basic configuration parameters into the integration flow, like endpoints, certificates, users, etc. 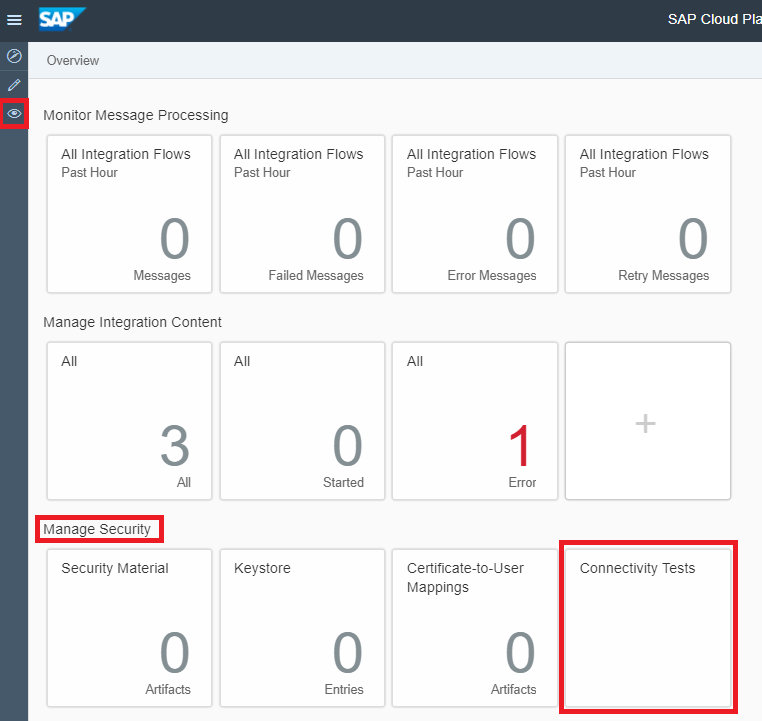 Since you do not update the integration flow, you remain eligible to receive updates to the integration flow when a new update is available. Make the required entries to the parameters. Once you are done with configuring the parameters of the integration flow, you can save or deploy it. Role: The above steps can be performed by a user having the AuthGroup.IntegrationDeveloper role assigned to himself. Once you are done with editing or configuring your integration flow, you need to execute it. The integration flow needs to be deployed in order to be executed. You will be informed that the integration flow is triggered for deployment. This indicates that there were no modelling errors in the integration flow. Go to the Operations View -> Manage Integration Content. 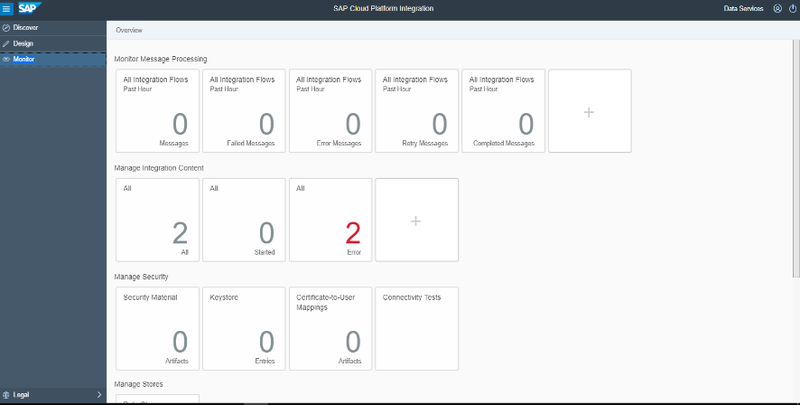 Click on the first tile – it will list all the integration flows that are deployed on the tenant. Ensure that the Status of the integration flow is set to Started. Role: The above steps can be performed by a tenant administrator. Once the integration flow is deployed and started successfully, it exposes an HTTP endpoint that needs to be configured in the DCS destination in Cloud Platform Cockpit. Look for the value of the address field. Here it is set to /sapdcs/dcs2gsp. Management-url can be found in the welcome email. Role: The retrieval of channel configuration to construct the HTTP endpoint can be performed by a user having the AuthGroup.IntegrationDeveloper role assigned to himself. 2) Communication between Cloud Platform Integration and the GST Suvidha Provider makes use of certificate based authentication. Making use of the steps mentioned under Setting up users, authorizations and roles, assign the role ESBMessaging.send to the user configured in the destination as highlighted above. Authorization: User Role – this indicates that basic authentication is used. User Role: indicates the role that the user must have to be able to be allowed to execute the process. Each Cloud Integration tenant has its own keypair that it uses to communicate for establishing a secure connection to the receiver. Check the on-boarding guide of your selected GSP for the list of trusted Certifying Authorities. If the signing authority of your Cloud Integration tenant’s own keypair is one of them, then you do not need to perform anything mentioned in this step. Proceed to step B-b. Else, you will need to provision a keypair signed by a signing/certifying authority that is trusted by your GSP. Upload this new key with an alias (say keyForGSP) into the tenant keystore. Using a tool (like Portecle or KeystoreExplorer) bundle the newly provisioned keypair into a keystore file (.jks). PS. As of today, the keystore self-service does not allow to upload a certificate or key into the keystore. It only allows to upload a keystore. Hence for every artifact that we want to upload into the tenant keystore, we need to create a keystore and add that to the tenant keystore. Again, as in step iv, start by creating a keystore containing the rootCA of the GSP’s key’s certifying authority and add that keystore to the tenant keystore. As of today, the keystore self-service does not allow to upload a certificate or key into the keystore. It only allows to upload a keystore. Hence for every artifact that we want to upload into the tenant keystore, we need to create a keystore and add that to the tenant keystore. Role: The above steps can either be performed by the Tenant Admin (AuthGroup.Administrator) or a user having the NodeManager.deploysecuritycontent role assigned to himself. Before you run your actual scenario, it is important to test if the secure connection to the GSP system from Cloud Integration happens successfully. If the connection works successfully, you get the following screen. Once you are done with validating the content in the development tenant, you need to move it to the production tenant to run it for productive scenarios/usecases. It is always a good idea to move the entire package rather than just the artifact. As of today, there is no automated content transport supported in Cloud Integration. As a result, the content needs to be transported manually. Click on Export on the top left in the package view to download a zip file containing all the content of the selected package. Now go to the production tenant and browse to the Design view. Clicking on Yes will overwrite the existing instance of the package. If you are pushing an update to the content, this should be fine. Role: All the above steps can be performed by a tenant administrator. 7) Additionally, a user (having the AuthGroup.IntegrationDeveloper role) will need to configure the copied integration flow to point to the production endpoints and update the corresponding users, certificates and aliases before it is deployed.